LEPO gathers the research activities of IRAMIS / SPEC in the physics of near-field Interactions. Artist view of an energy transfer process at the nanoscale (POVRay). Photonics is the science and technology of the production of photons, their propagation, their processing and their absorption by matter. 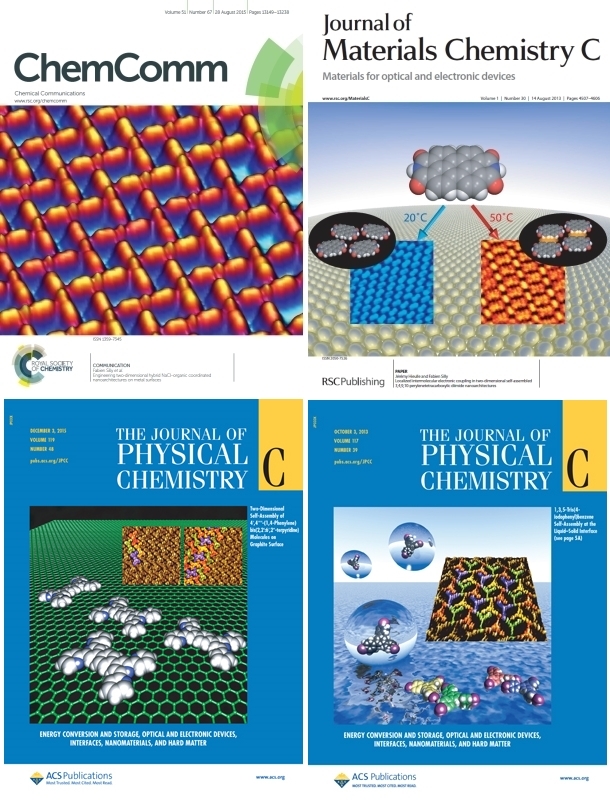 The photonic properties of condensed matter depends on the intrinsic properties of its constituents (molecules, crystalline lattice,...) but, as importantly, on their organization at the nanoscale. Thus, nanophotonics addresses the various processes of interactions of light with matter at scales smaller than the wavelength (the wavelength of visible light is between 400 and 700nm ) . The nanophotonics laboratory focuses on molecular plasmonics, that is the various processes involving photonic interactions between conjugated molecules and metal nanostructures. The design and development of hybrid nano-objects with innovative photonic functions is undertaken by combining the following aspects of nanophotonics. The applications, addressed in various multidisciplinary collaborative projects, are in the areas of energy (photovoltaics, cold lighting), life sciences (optical molecular labels, phototherapy, sensors, actuators), information and communication technologies (integrated nanophotonics, data storage). 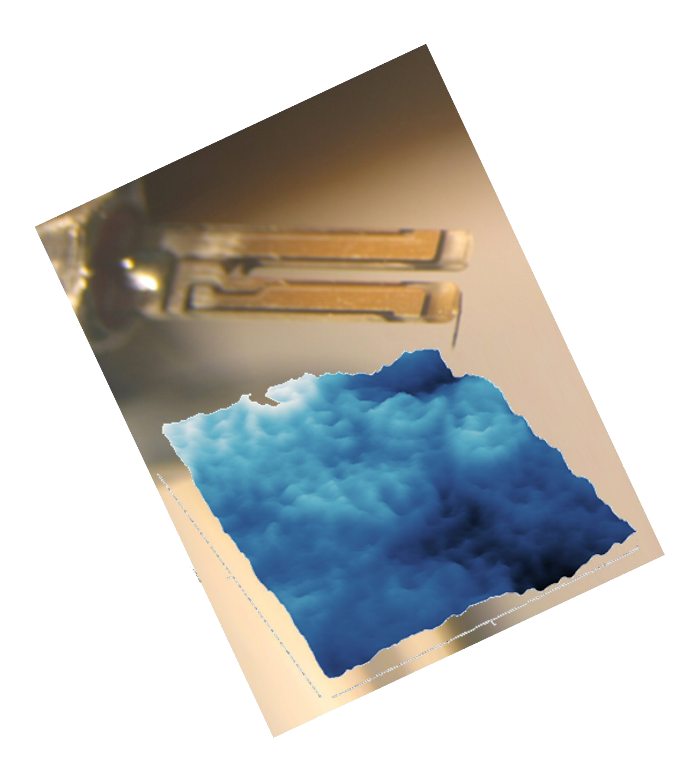 Low force AFM (in blue) on murine Anti-Ovalbumine antibodies (IgG), using a quartz crystal tuning fork with a tip glued to one of its prongs (not the same scale). The morphology of the immobilizedl film (in blue) locally displays circular multimeric structures with 15nm radius resembling IgM antibodies structure. Atomic Force Microscopy (AFM) has become a widespread morphology investigation tool in surface sciences thanks to its remarkable versatility that allows studying various materials including dielectrics, liquid-solid interfaces and biologic objects in very diverse environments (atmosphere, gas, liquid, under vacuum). In the lab, we develop our own method based on quartz crystal tuning forks in custom 0PM-AFM (Zero Phase Modulation) mode to study in air and in liquid soft materials. Thanks to its high quality factor, the sensitivity of the probe remains sufficiently high to observe tridimensional alcane film structure at the liquid-solid interface with true atomic resolution, or to directly observe in air the molecular structure of functionalization films on biosensors developed in the lab. Atomic Force Microscopy has become a widespread morphology investigation tool in surface sciences thanks to its remarkable versatility that allows studying various materials including dielectrics, liquid-solid interfaces and biologic objects in very diverse environments (atmosphere, gas, liquid, under vacuum). In the lab, we develop our own method based on quartz crystal tuning forks in custom 0PM-AFM (Zero Phase Modulation) mode to study in air and in liquid soft materials. Thanks to its high quality factor, the sensitivity of the probe remains sufficiently high to observe tridimensional alcane film structure at the liquid-solid interface with true atomic resolution, or to directly observe in air the molecular structure of functionalization films on biosensors developed in the lab.